DIGITAL BRITAIN: report sets switch-off date for national analogue radio | What Hi-Fi? The report expects these criteria to be met by the end of 2013. As part of this the report welcomes manufacturers' commitment to making sub-£20 DAB receivers in the next two years, and urges them to look at 'FM rebroadcasters' - set-top DAB-to-FM adapter boxes. 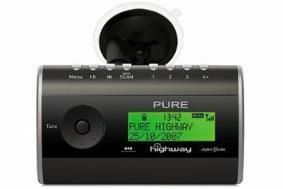 In the in-car arena, the report commits the Government to working with car manufacturers to ensure all new cars have DAB radios by the end of 2013, encourage the development of converters such as the Pure Highway (illustrated), and build DAB into sat-nav devices.